This time of year hundreds of birds come to the mountains. Before the sunrise they begin to awaken, as they do, they begin to sing their various songs. All together they sound like a boisterous cacophony, but soon you hear their individual sounds and it becomes a symphony of beauty and awe. I suppose there is no one word to describe such a beautiful scene and I'll have to write a paragraph to describe this most inspiring of God's creative wonders. I have the impression this usage is more common in BrE than AmE - I don't know of any widespread AmE alternative, but I stand to be corrected on that. And I don't know any equivalent term for deafening birdsong in the evening (which I suspect in my area is exacerbated by all-night street lights; the birds never just shut up and go to sleep). ...which clearly shows that - as I suspected - the usage is significantly more common in BrE. But I still don't know any AmE equivalent / alternative. 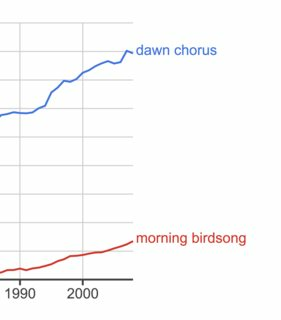 "The chorus of birdsong could be heard every day starting at 5 am"
"Birds sang in chorus as the sun rose"
"Duetting and chorus singing in African Birds"
"A 20 minute-long recording of birds singing in chorus"
I too like morning chorus. Consider birdsong too. the musical call of a bird or birds. 'Daylight and a loud chorus of birdsong woke them'. Through the open window came a trill of morning birdsong. Symphony? Forget it. Morning birdsong is a conglomeration of soloists, busily singing as loud and as often as they can, with no regard for the overall effect. In AmE birdsong is also used for morning, evening, after storms and during the mating season. See the following Ngram search of AmE usage. Dawn chorus prevails. A Decemberists song called "June Hymn" contains the lyric "a panoply of song" to describe the "dawn chorus". Panoply is a noun which means "an extensive or impressive collection"; "a splendid display"; or "a complete suit of armor" (to get medieval). Does the word “but” sound odd here?